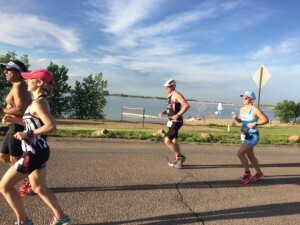 Last Thursday was the 1st running of the annual Without limits race series out at the Boulder Reservoir. I'd attempted to race one of the series last year, oly I forgot my run shoes. So rather than race the 750m swim, 5k run, last year I did the 1500m swim and DNF'd. So, I wasn't hopeful this year, I'd only swum twice since November 11th, and my running had suffered a similar fate. Come race day I was busy running around doing chores. We'd had a late a breakfast, so I skipped lunch and later picked up some dried fruit mix from Sprouts. Thats a mistake I'll never make again. Come race time I felt lethargic, and out of the water after what was choppy swim, I had stomach cramps. I guess it takes much longer for rock hard dried fruit to get digested. I blew up(and possibly off) a few times on the run, and it was hot. Thankfully after a last walk towards the only part of the course to have any elevation, it was downhill to the finish. I got 2nd in Age Group, and fortunately that wasn't DFL in age group, there were three of us. I don't plan on running the series, but will do probably one other race towards the end of the series as a comparison. Talking of comparisions, my 16:34 swim, was better than both my laps from last year, where I clocked 16:46 and 17:34. You did it and finished. I learned that during swims I don't do apple oatmeal, the apples never dissolve in my stomach. But you finished!! !